The CRVW3 is a self-contained, low-cost, 3-channel VSPECT™ vibrating-wire datalogger. It is designed to be an independent datalogger, or a reliable component in a larger data acquisition system. 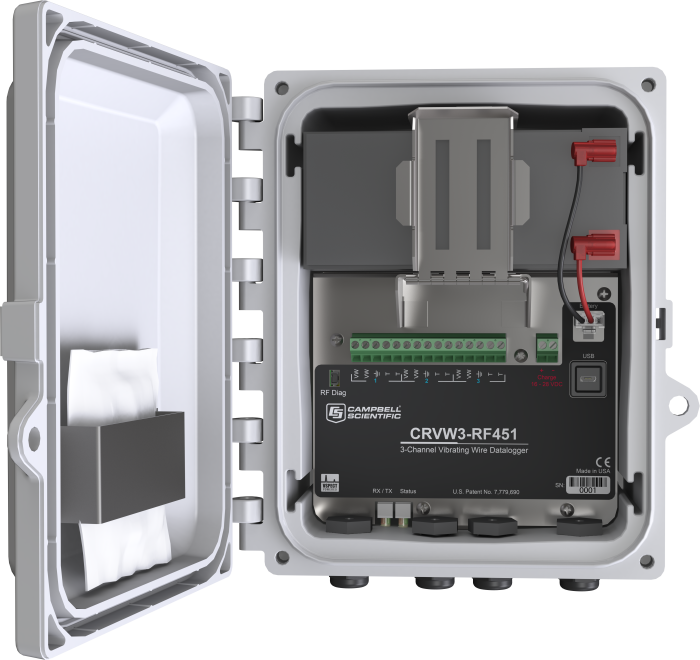 Arriving field-ready from the factory with power, communications, and an enclosure, the CRVW3 is built for your monitoring needs. The CRVW3 uses vibrating-wire spectral-analysis technology (VSPECT™) to provide the best measurement possible for vibrating-wire sensors. VSPECT™ observes the incoming sensor signal, performs a Fourier transform and a spectral analysis, and determines the sensors’ frequency by identifying the strongest signal in the acceptable range, disregarding external noise. Note: The CRVW3 requires Device Configuration Utility (DevConfig) v 2.10 or later. When radio options are used, the CRVW3 requires LoggerNet v 4.3 or later. All CRVW3 dataloggers are tested and guaranteed to meet the following electrical specifications in a -40° to +70°C non-condensing environment. -RF412 options are not CE approved. The CRVW3 can be ordered with several wireless communication options. The following table illustrates wireless communications compatibilities in terms of networks. Notes: aRetired product; no longer available. The CRVW3 comes in a package designed for field deployment. The electronics, battery, and electrical connections are all contained within the enclosure. The CRVW3 is supplied with a basic mounting kit, or a metal universal mounting bracket can be added to facilitate installation on a post or wall. The CRVW3 can be ordered with either a rechargeable battery or a D-cell alkaline battery pack. When the rechargeable battery is used, the CRVW3 can be easily wired to a solar panel, and the rechargeable battery will be charged using the built-in regulator on the CRVW3.